Jibia is a giant squid (a/k/a Humboldt squid) which is found in the eastern Pacific ocean. 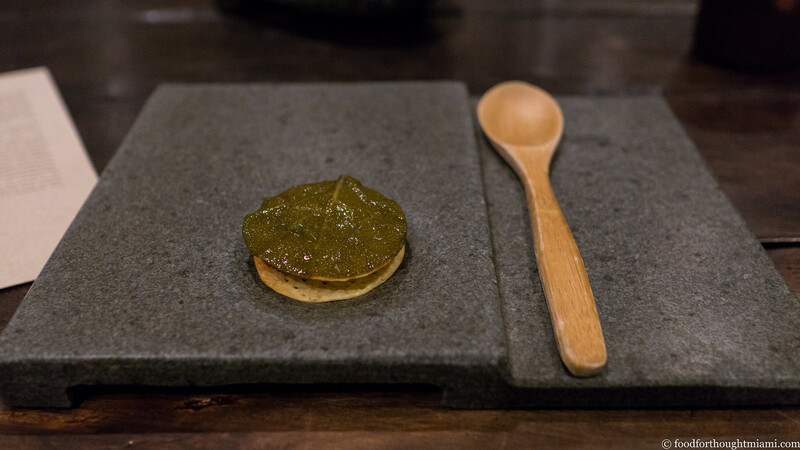 A blocky cut, about an inch thick, was served in a creamy pajarito yogurt sauce, garnished with orange zest and herbs, topped with a "cuchufli" (traditionally, a crisp tube-shaped cookie) of dehydrated cochayuyo seaweed, and served with a marraqueta (a traditional crusty bread roll), brought to the table inside a brown paper bag. And here's a good example of how a little knowledge can change the experience of a meal. The day before, we'd eaten at Las Cabras, a straightforward "fuente de soda" serving mostly traditional Chilean dishes. Our dinner companions, who were locals, explained to us that the "pebre" that was brought to us right after we were seated – a salsa-like concoction of tomatoes, onion, cilantro and chiles – is a common, multi-purpose condiment on Chilean tables, often scooped up with bread, sometimes used as a sauce. 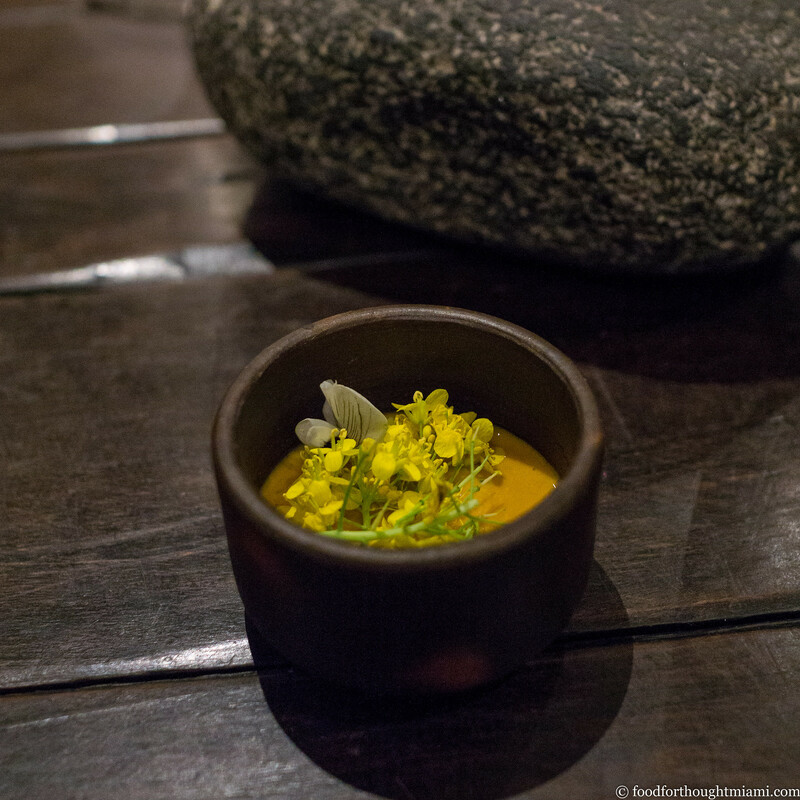 This version, served as an accompaniment to the marraqueta, was made with sea urchin and garnished with flowers. It was delicious and beautiful without knowing a thing about it, but recognizing the reference point gives it context and significance beyond just flavor. 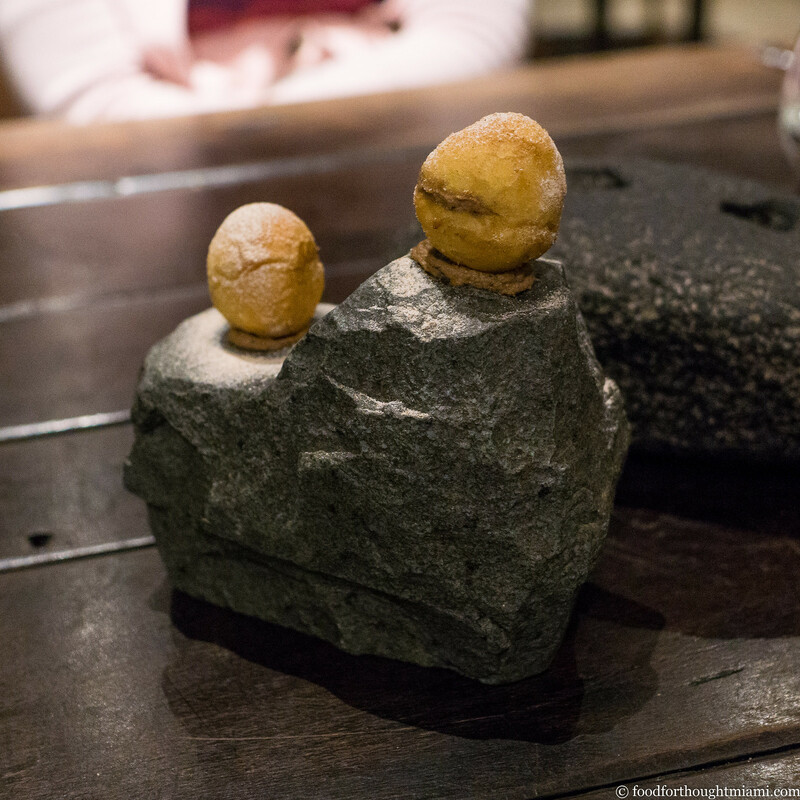 A series of rock-themed dishes came next. 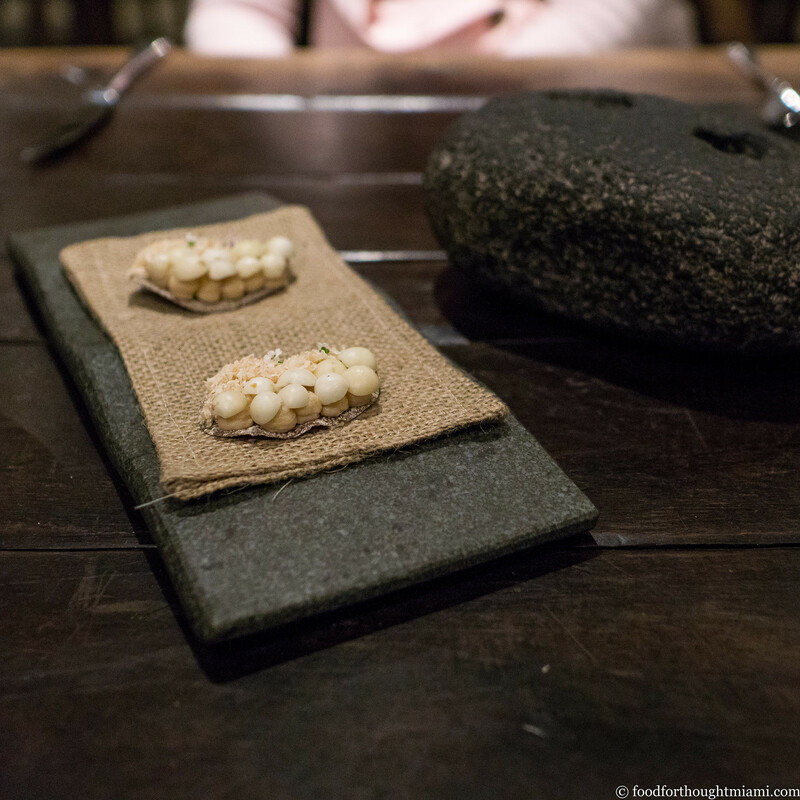 First, a little snack, these "cuchufli of the sea," puffy one-bite pastries filled with creamy seafood, presented perched on a stone. 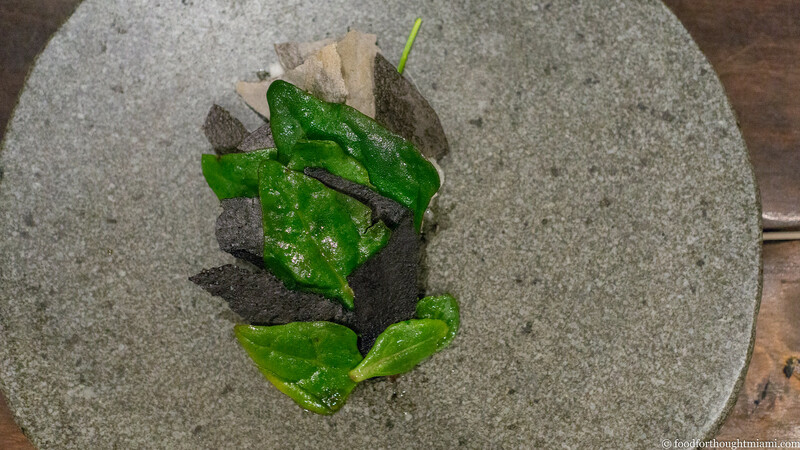 More of the rocks theme: this salad-like dish featured items foraged from the rocks of the Punta de Tralca, along the Pacific coast due south of Valparaiso: sea spinach, wild onions, and crisp black chips (dyed with squid ink?). 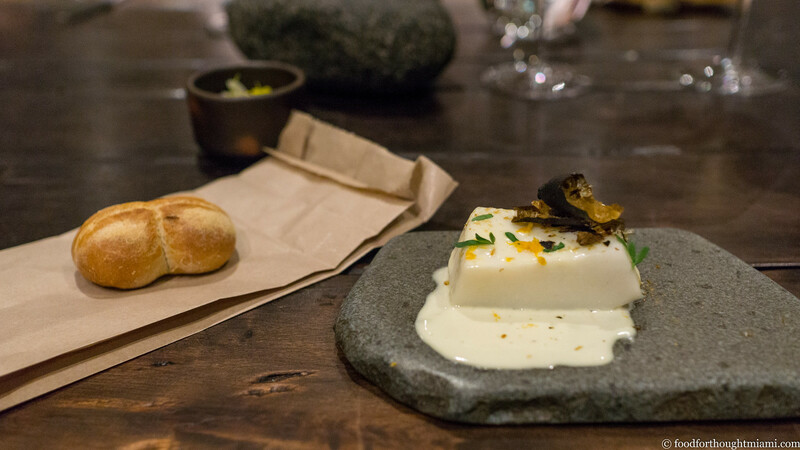 As the final installment, a dish that Guzman has been toying with for years: a "pulmay de rocas." From a bit of homework, I gather that a "pulmay" is a traditional one-pot stew cooked in a pit with hot rocks, also called "curanto" in the Chiloé archipelago where it originated thousands of years ago. 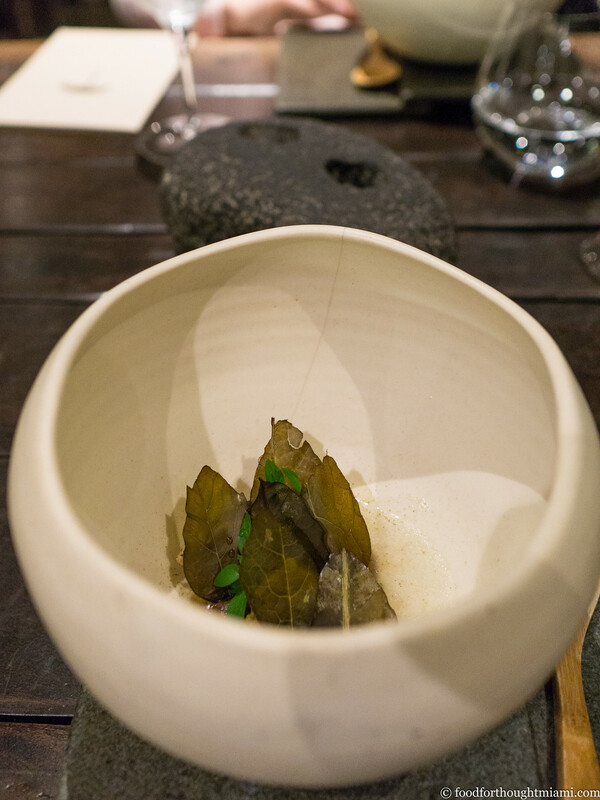 Boragó's version is something of a "stone soup" – a big carved stone bowl with a few smooth stones in it, one of which is crusted with a crackly-surfaced paste of black beans, a tuft of green seaweeds nestled alongside. 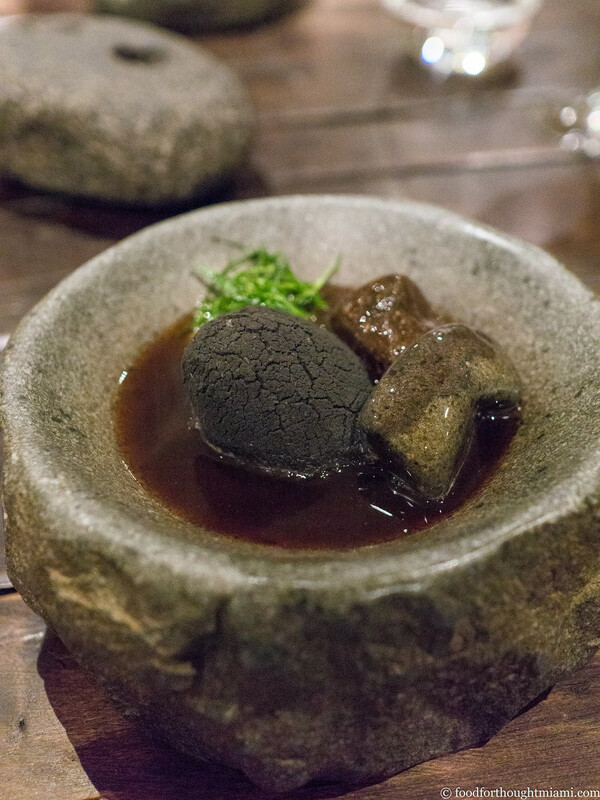 A warm, dark cochayuyo seaweed-infused broth was poured into the bowl, and you scrape the bean paste off the rock. 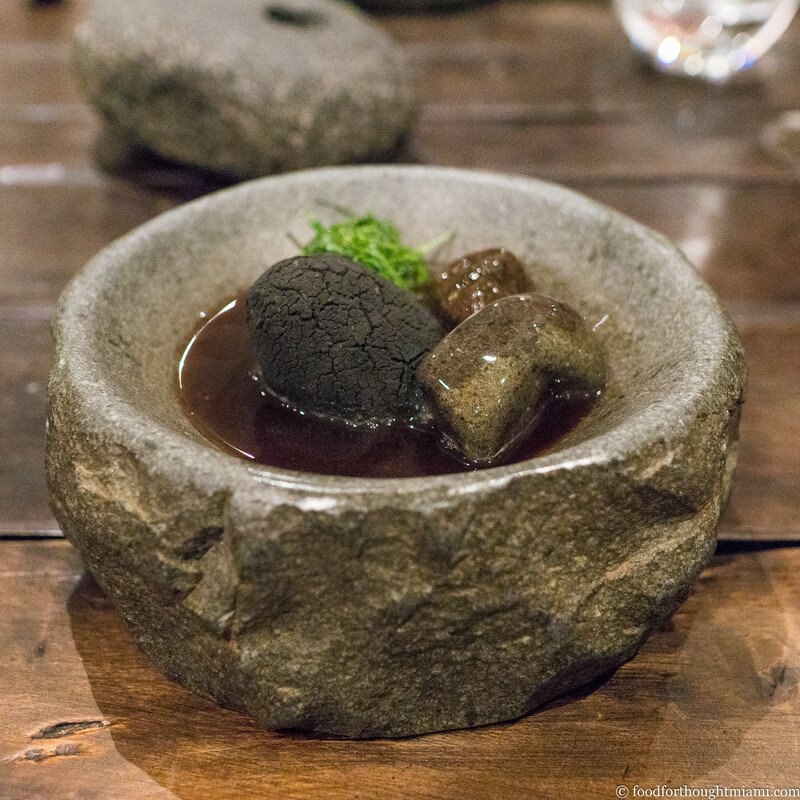 The cochayuyo, a native bull kelp, gives the broth a nearly black hue and a flavor like a concentrated kombu dashi, with the same satisfying umami depth. 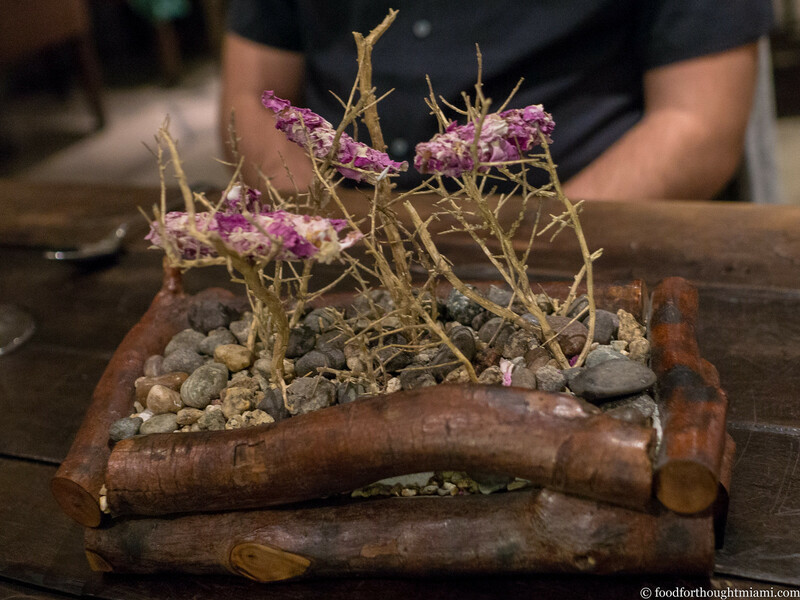 The wild greens served with this dish are only in season for a few weeks at the very start of spring, what Guzman calls "pre-primavera" (afterwards, they become too fibrous and woody). 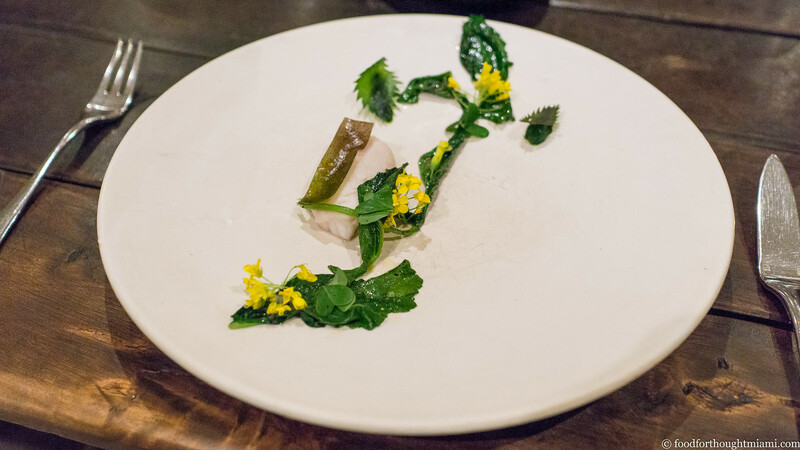 Those flowering greens, with some nettles, were accompanied by a tranche of rockfish steamed with seaweed. 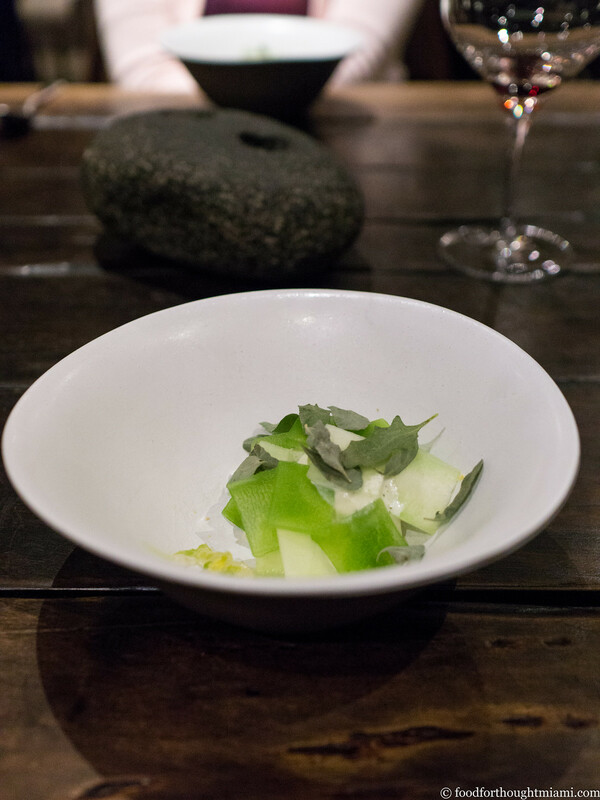 The dish was delicate and mild – like the moment it captured on a plate. Another little snack as an intermezzo, a "crudo" of pine nuts in several different forms: a creamy purée, chewy buttons, a finely shaved powder, all mounted on a cracker. 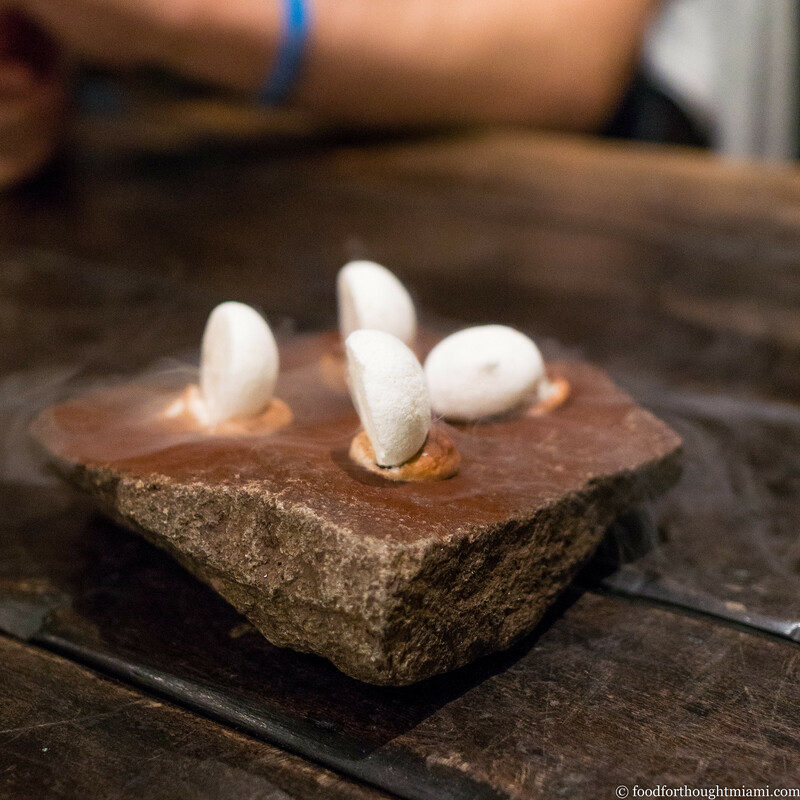 For the final savory course, lamb from Patagonia, cooked over Tepú charcoal for ten hours. Whether the result of its Patagonian lifestyle, the cooking over fire, or maybe just the power of suggestion, this was some delicious lamb: its fat fully rendered and crisp, its flesh melting and tender. 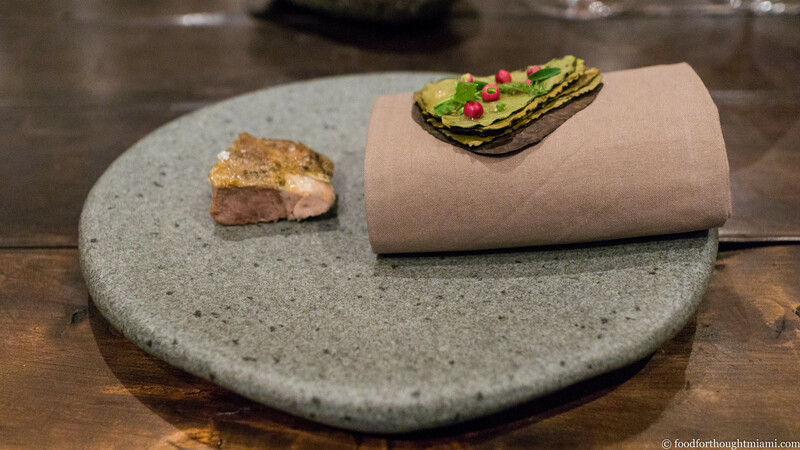 It was served with a "millefeuille" of vine leaves, rubbed with tangy kombucha, and topped with "wild apples" from Patagonia. (These pinkish-red berries, with resembled miniature apples, I think were actually murta, or Chilean guava). 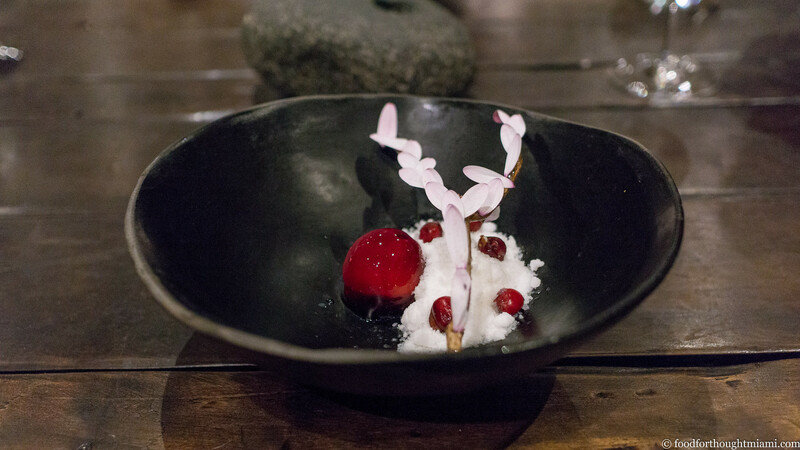 The first dessert, a "cuchufli" of almond paste and preserved rose petals, was a striking visual presentation with a fascinating backstory. The flower petals come from the Atacama desert, one of the driest places on earth, where there is typically less than an inch of rainfall per year. As you might expect, it's a rather barren landscape. But in seasons where there are heavier rains – typically only once or twice a decade – the desert floor blooms for just a few weeks of the year with these roses, whose seeds can lay dormant for years. Last year was one of those years (see some amazing pictures here and compare to what the desert looks like now), and Guzman preserved its bounty for use at the restaurant, These delicate candies, mounted in the brittle branches of desert bushes, were deliciously sweet and nutty and floral. We actually visited the Atacama desert just a couple days after our dinner at Boragó. While there, as we were returning from an excursion to the Puritama Hot Springs, our guide pulled the truck over and jumped out. She'd gotten a call from the kitchen requesting some rica rica, an herbaceous desert plant, and we were at the right elevation to gather some (you can see the bushes in the foreground of this picture, and the tiny leaves here). Rica rica, with its bright aroma, somewhere in the family of mint, sage, or eucalyptus, is used both as a flavoring agent (it brightens up a pisco sour) and for medicinal purposes (an infusion of its leaves is supposed to aid digestion and circulatory issues). Here, it flavored a creamy ice cream paired with apples infused with oregano. Next was an unorthodox version of "tres leches," typically a cloyingly sweet dessert using condensed milk, evaporated milk and heavy cream. Here, instead, the three milks were donkey, goat and cow, each used in a different form in combination with peumos (berries from a Chilean acorn tree) and beets, and decorated with a branch stuck with edible flower petals. 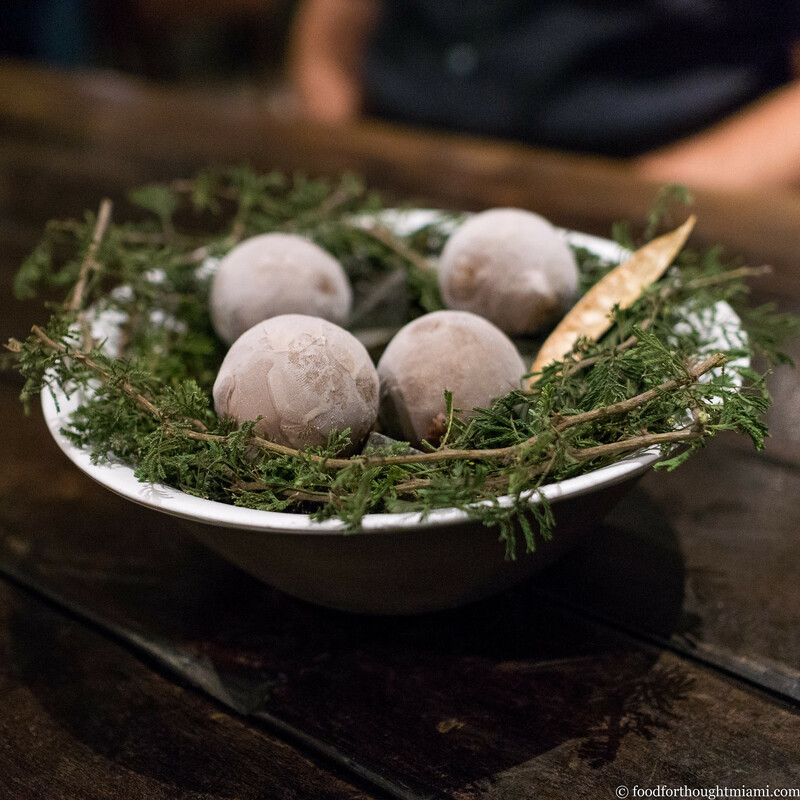 The same mushrooms as were featured in the chupe at the start of the meal were used to flavor this ice cream for dessert, served in combination with a sweet, nutty paste of espino, made from the seed pods of an acacia tree. I've had candy cap mushroom ice creams before – we even saw it an ice cream shop in Fort Bragg up in northern California – and have enjoyed them all. This edged even a little closer to savory than those, but still had a delicious sweet forest floor complexity. 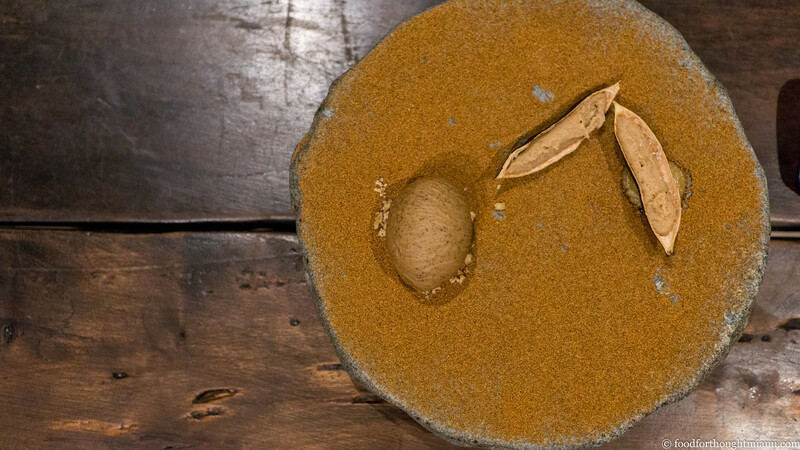 Espino was also used to flavor these coulants, their hard-shelled exterior giving way to molten interior. As a final bite, a dramatic after-dinner mint, frozen in liquid nitrogen to give a dragon's-breath effect. (edited to add): Boragó offers both a wine pairing and a non-alcoholic beverage pairing, and between the four of us, we tried both (as well as a very nice pisco sour to start, made with mora berry juice, and a gin and tonic garnished with more of those Atacama rose petals). The wines, of course, were all Chilean, and notwithstanding my preconceptions about Chilean wines (as I mentioned earlier), a couple were eye-openers for me. I was intrigued by a fresh, bright syrah / grenache /malbec blend from Viñedos de Alcohuaz, situated on the southern edge of the Atacama desert, which presses grapes by foot and ferments in cement eggs for a year. I was entranced by the Ocio pinot noir from Cono Sur, which was elegant and sappy and balanced. The non-alcoholic pairings were possibly even more interesting, ranging from an infusion of espino and algarrobo (carob?) served in a pipe like yerba mate, to a tangy, allium-infused ceviche juice, to a combination of black tea, mora juice and merken spice that echoed the complexity and balance of fruit and tannin that you find in wine, to a soft, almost creamy blend of strawberry juice infused with trigo (wheat). 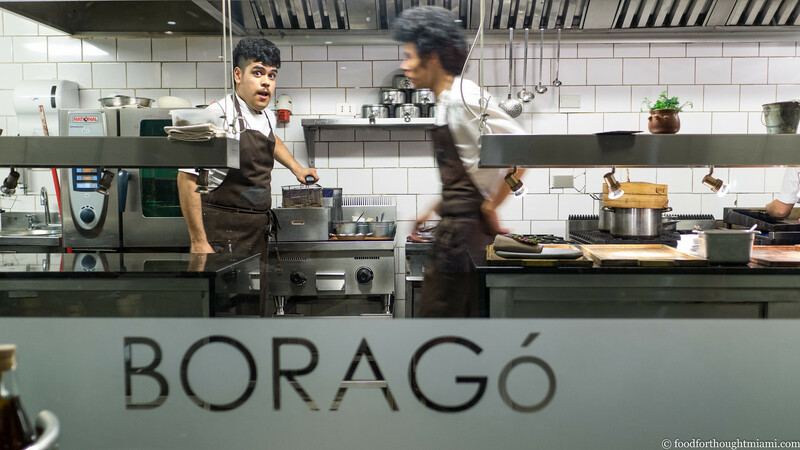 Boragó operates as a crash course in the cuisine and culture of Chile. One of the challenges of that approach is that if you don't know much going in, it's like showing up for class without having read the materials first: a lot of it may go over your head. I cannot recall the last time I tasted, in one meal, so many things that were unfamiliar and new – used not just for novelty, but because they have a story to tell. The more I understood of the reference points this meal invoked, the more I appreciated it. 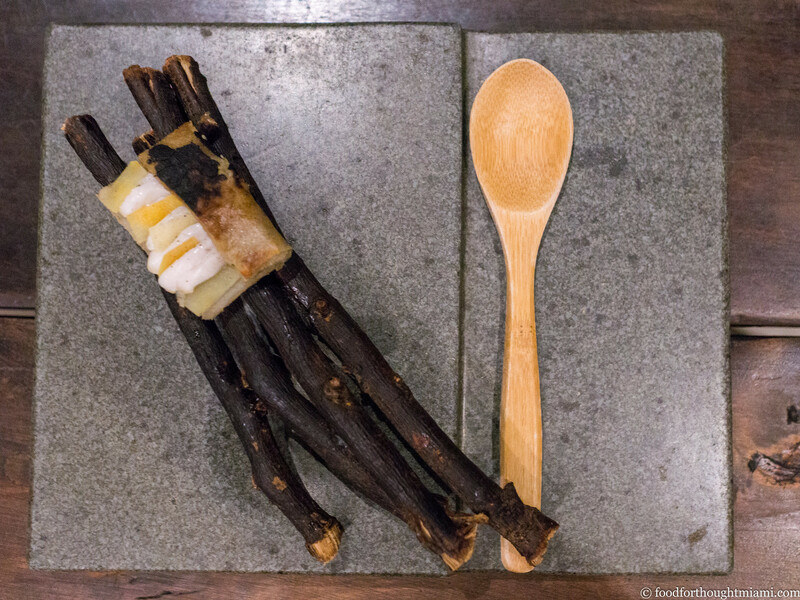 For further reading on Boragó's foraging program, I highly recommend this piece in Roads and Kingdoms by Nicholas Gill.Gill also wrote about the wild edibles of the Atacama Desert in the New Worlder, which was an all-around good resource on Chile. For further reading on the Atacama roses: "The Atacama desert is a glorious spectacle of gorgeous pink." According to our guide, anyway, the use of a doubled name like "rica rica" signifies the multiple uses of a plan. As another example, "pingo pingo" (a/k/a ephedra chilensis) is thought to aid respiratory issues, and also work as a libido enhancer. The short version, as I said earlier: perfectly drinkable, eminently forgettable. I have a theory: when it's too easy to make good wine, it's harder to make great wine. The Chilean wine regions seem to offer some near-ideal conditions for growing grapes, and produce perfectly fine, good wines; but most that I've had lack complexity. Meanwhile, many of the wines I really enjoy come from old vines, steep, mountainous vineyards, rocky soils. Maybe it's just romanticism on my part, but I believe that struggle builds character. For all I know, I was drinking wine which DocSconz's feet had pressed.